No matter what field of selling you may find yourself in, there will always be an assortment of undeniable factors that will set you above the others and allow you stand out from the crowd. Understanding the following three points will go a long way to achieving just that end. Fact No.1 – Average salespeople tend to seek out other average salespeople and then ask their opinion on a given subject. But above average salespeople tend to seek out sales professionals and experts and ask for facts. Fact No.2 – Average salespeople feel uncomfortable asking for an opinion from an expert, because experts generally will not be draw into giving opinions, experts tend to deal in facts not opinions. The most important lesson to learn here is that above average salespeople avoid other people’s opinions, unless they are selling or negotiating a sale – and then they would qualify the opinion hard to see if it was based on fact. Fact No.3 – Average salespeople who want to become above average salespeople have to learn to stop asking for opinions and start dealing in facts – no matter how good that opinion sounded to them in the first place. By now you should have worked out the point I’m trying to make. In the main, like attracts like, winners attract other winners and because of that apply winning strategies. The average attracts average and they tend to copy the same strategies other average sellers use, and it’s those strategies that will keep them average. To became a winner, you need to learn to act like a winner, and that means you must begin to deal in facts and not the opinions of others. Generally, the ones that are focusing mostly on facts from the information they have researched, are the ones with the biggest runs on the board. Little wonder they are considered to be or become the best performers in that company. facts on the potential they see in the future. Once you are aware of the facts, you are then in possession of qualified advice from which you can make your own quality decisions. That way, the odds are in your favour, and you can now go ahead and be in a better position to make the night move. So don’t listen to opinions. Opinions are generally given by those who don’t know the potential the sacrifice and the pit fall’s or even which road to take in the journey towards success. Opinions too are cheap – in fact, any opinion is dangerous, and even more dangerous if given by anyone who is average, just above average, or even better than average. It seems that only the winners are prepared to make decisions based on worthwhile facts and statistics. And this group especially aren’t interested in anyone’s opinions. They listen, be courteous and move forward only when they have the facts at hand. Understanding the fundamentals on a specific subject in any field of selling you choose to be in, being able to get a “good grip” on understanding and being able to communicate those factors. Once the salesperson is able to appreciate that fact, they will more than likely set them above the others and subsequently allow them to stand out from the crowd. When used as suggested, those words are both soft and gentle, yet they also get the message across that it’s time for a decision to be made. Emphasize the emotional aspects of the sale. If you remember that people make decisions emotionally, you’re half-way there. But if then you must understand that you will need to defend those decisions with logic to fully emotionalise the selling process. In order to achieve this end, you must prepare with the logic, but sell with emotion, because it’s the easiest way to get them thinking about how they’ll feel after they own the product or service. Stop talking. Whenever you ask anyone for their business, wait for the answer. Don’t talk, just wait. It is a known fact that the first person who talks owns the product or service. So stay quiet until the prospect gives you an answer. They’ll either make the purchase or give you an objection. Once that happens, then you can talk, but not before. This Article is by Peter Collins – In a sales career spanning more than 50 years, Peter Collins has focused on helping and bringing out the best in others – whether it involves training or mentoring salespeople, managers, business consulting to SME’s. 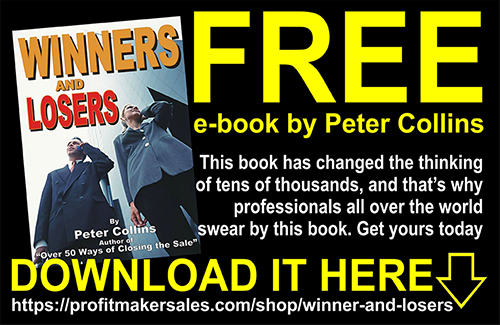 Since the 1970’s Peter has built a reputation as a Nationally and Internationally Published author, and has 65 books to his credit, but he is mainly known for one book based on the Audio Tape series of the same name, Over 50 Ways of Closing the Sale. In his personal life, Peter has been sought after as an encourager and motivator that has given of his time and talents freely despite his busy schedule. Subsequently, he has assisted churches, pastors, community and charity groups, as well as individuals through his teaching, training, development and on-going mentoring.